The most daunting part of anxiety is the sneak attack. Anxiety might decide to come play while you are buying bruised organic avocados at the grocery. It might miss you so much that it decides to rear its head during a coffee date with friends. She (I’ve given my anxiety a sassy female alter-ego) might decide to stop by and say hey while you’re 12 episodes deep into Orange Is The New Black. Anxiety is overwhelming simply because it pops up unannounced. These annoying sneak attacks have given me the opportunity to learn how to combat that unwanted wave of panic. The biggest thing I have learned is to always be prepared. Build a physical, mental, emotional, spiritual toolbox that you always carry. This can be a gray area because some people use items to distract from anxiety or associate certain items with stopping panic. I don’t want you to try to stop it. I want you to ride the wave and have tools that will make you more comfortable during the journey. Tell yourself how awesome you are! Plan ahead, use your toolbox, and dominate life. Over the years, I’ve learned that I can lessen the extent of my anxiety by preparing. If I’m nervous about an interview, I might type the address of the office into Google Earth to see a street view of the building. I might lay out my clothes the night before and have my tea mug laid out. I might drive to the location an hour early to prepare for traffic. I might bring an extra pair of clothes if I spill something on my interview attire. This literally happened in the past (insert long sigh). I might prepare answers to common interview questions. Another example of the benefit of preparation is going out for a weekend hike. I will meticulously plan what supplies, clothes, food I need. I will look at the weather and prepare extra gear. I will carry supplies that could last me a few days if something happens. You have to stack the deck, make the odds in your favor. Anxiety does sneak up and you can’t always be ready. But…you can be better prepared to journey through the fear. Preparing for our weekend hike! Kemp’s massive “bug out bag. The military taught him well! Modern medicine tends to fixate on diagnosis and treatment, whereas a wellness lifestyle focuses on education, self-awareness, and prevention. Instead of merely treating disease, the wellness lifestyle addresses its causes-what lies beneath the disease and its symptoms. In 5 short months, I will be a family nurse practitioner. My journey in medicine started a decade ago when I began volunteering at a local hospital. At the ripe age of 16, I learned about getting my hands dirty. I mean that metaphorically and literally. Seeing patients in the hospital fascinated me. During a lunch break, I ate my stale bagel and reflected on my experience. Why did she wait so long to get a check up? Why did he give up on his health? Why doesn’t she seem to care about what is happening to her body? My thoughts were, perhaps, non-traditional lunch break thoughts. However, I was truly curious why people waited until the brink of death to seek help. I grew up going to the doctor for annual check-ups and learning that preventative health was important. I understood that physical fitness and healthy foods were important. I have carried those core values into my professional life. My greatest wish is to see people take care of mind, body, and spirit. Treat yourself kindly and create a body that is strong and healthy. When you do get sick, I am here for you…but take the first steps towards prevention and wellness! So fresh and so clean…clean. My mat smell smacked me in the face during this morning’s Adho Mukha Svanasana. There is something to be said about the power of hot yoga class sweat. My mat needed some loving and some scrubbing. 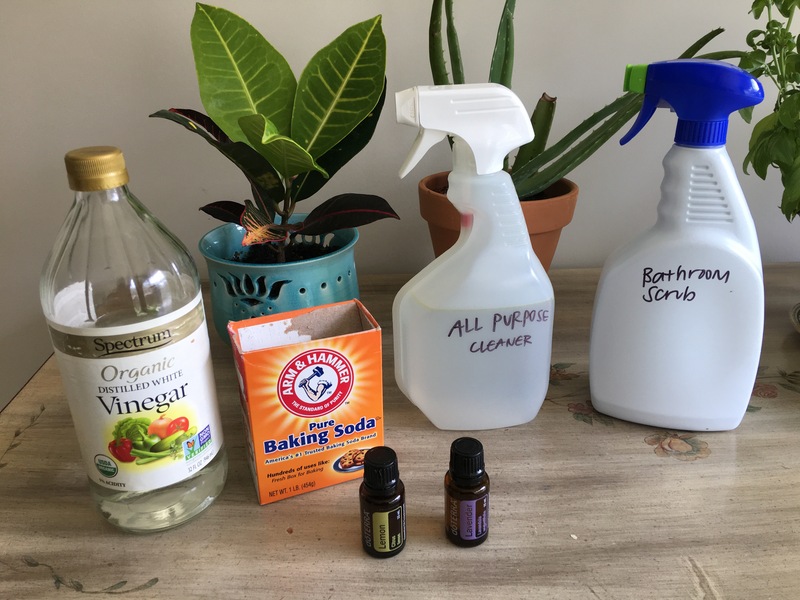 I channelled my inner boho spirit and made homemade yoga mat spray. It smells pretty rad and works well as an anti-microbial cleanser. The yummy smell is courtesy of various essential oils. I cleaned a spray bottle that I found in my closet. The original contents remain a mystery. What can I say, I like to live on the edge. I filled up the small bottle with water and a splash of vinegar. Be sure to save some room to add the oils. I dropped in the three essential oils. You can use as many/few drops as you would like…I put an estimate because that is what fancy bloggess women do. Shake it up. Spray both sides of the mat and scrub with a sponge. Finish by wiping the moisture off the mat. Hang it outside to give it some sun love! My mat smells like a delicious lavender field filled with dancing peppermint fairies. I could just eat it, but that is inappropriate and also a disease called Pica. Please consult a healthcare provider if you feel inclined to eat your yoga mat. This blend works for me because it smells amazing, but also has germ-crushing properties. Various research has linked tea tree oil to anti-microbial properties. Yes, there is a kayak in my living room. Casual. Essential oils are a great way to hit the pause button during a toxic stream of consciousness. I have recently started incorporating them into my healing journey. The limbic system controls a lot of our emotions and aromatherapy has been proven to calm that center of the brain. This oil is great to calm the butterflies in the tummy! It has antidepressant effects and has been proven to work even better than lavender! These are personal tips for what works for me and is in no way affiliated with any medical advice/brand promotion. Go forth and breathe yourself to calm. Some of my oils with a chakra flag in the back.